Last Friday night, the psychedelic dance pop band Of Montreal filled Lincoln Hall with a sold-out show. Before the group took the stage, the dance floor slowly swelled in size and humidity. Loud chatter emitted from the bar and teeming crowds amassed outside will call. This tableau seems to suggest that nothing was amiss about the gig; however, this concert, like any other, has a story. Of Montreal is not new to Chicago. For those who don’t know, the group is not an obscure collection of Canadians but a Georgia-based indie powerhouse that pioneers and sustains faith in small labels. The band emerged almost 20 years ago as part of the Elephant 6 collective, a small group of musicians who fostered notable strides in alternative music. Among these was the famous Neutral Milk Hotel. However, unlike NMH, Of Montreal continued into the 21st century and rode a gradual uphill slope to indie superstardom. The 2007 album Hissing Fauna are You the Destroyer? launched the musicians to magazine covers and festival headlines. Despite all the wonder and creativity produced by the group and its larger-than-life front man Kevin Barnes, its future is currently unclear. Many claim the band has lost its luster following Hissing Fauna and accuse Barnes of becoming increasingly indulgent and inaccessible, making his work almost unbearable. The negativity does not seem to stop in the hollow words of cranky critics. 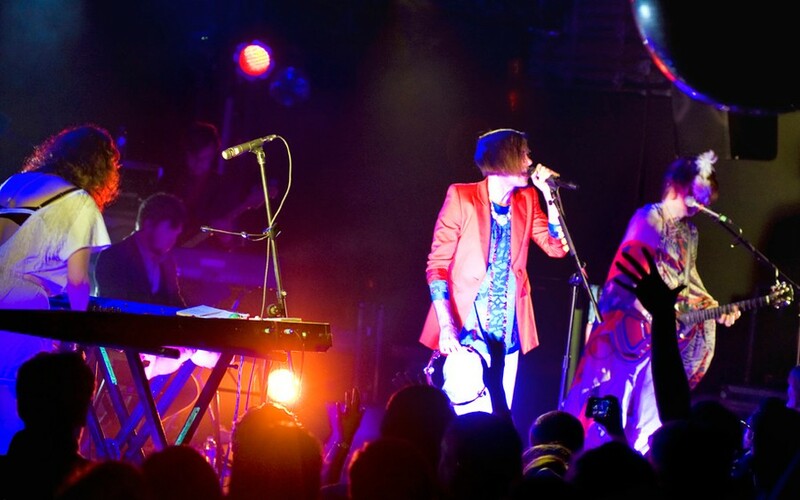 Of Montreal’s last visit to Chicago on its 2012 tour featured a show at the Metro. The venue has an occupancy over double the size of this year’s location, putting a damper on the show’s sold-out status. Is the band washed up? Is it ready to enter the indie retirement home along with The Strokes and The Shins? These were some thoughts running through my head as I waited for the lights to be dimmed. I had seen the same band closing for festivals in front of thousands. Now, I could almost touch the crowded stage and count the faces in the audience. Everything seemed so odd, and when the band arrived it was like the emperor without his clothes. It was definitely over the hill. The room seemed to exhale a collective tired sigh as the group predictably opened with “Wraith Pinned to the Mist,” its only mild hit from the last five years. Next on the set list came singles from Hissing Fauna. I danced and sang along to the classics, but part of me was weeping. Barnes was clearly not loving the tunes. He delivered with less gusto than I did on my last p-set. I loved the music, but the band looked like it was going through the motions. However, as soon as I resigned myself to accepting the fate of this indie legend, I sensed a shift in atmosphere. The band surprised the crowd with its 2012 track “Feminine Effects,” pulled from an E.P. I had always enjoyed the song but did not expect the influence it had on us all. The soulful delivery of this beautiful country-psychedelic hybrid triggered a renewed devotion. We weren’t here because we were bored and we weren’t here to see the latest attraction. This was how music should be and Of Montreal was good at making it this way. The remaining half of the night turned into a whirlwind of unprecedented energy verging on violent and plain gross. The crowd felt united with the band as it seemed to announce, “We’re still here and we’re not giving up.” All the negative press and declining ticket sales suddenly became ridiculously trivial. The fans were still dancing their pants off and the tunes were still out of this world. The love hadn’t faded but only matured like a fine wine. Barnes had shaken off his flaky fans looking for the latest band and now was partying with his die-hard followers. The spiked enthusiasm also signaled the start of the group’s famous showmanship. As usual, the stage became inundated with figures in every costume imaginable ranging from the sexual to downright weird. The dancers acted out dramatic scenes of love and despair, weaving in and out of the musicians and even engaging the raging spectators. As I sang myself hoarse to the closing number “She’s a Rejector” and dodged a crowd-surfing dancer dressed as Captain America, I felt a sense of warmth, realizing how my love for this music had lasted and grown. These weren’t some teenybopper wannabes: They were the real deal, the kind of band that breathes life into the word “indie” and makes multi-clausal titles acceptable. Above all, they put on a good show and make loyal fans like me come back for more. They might be washed up, but nobody’s told them yet, and besides—they probably wouldn’t listen.